Angel investors in the country have kept funds flowing for startups at a time when venture capital investors seem to be holding back. In the first nine months of 2016, the value of investments has declined significantly across all investment categories such as private equity and venture capital but angels and seed funds continue lending a hand to early-stage companies. 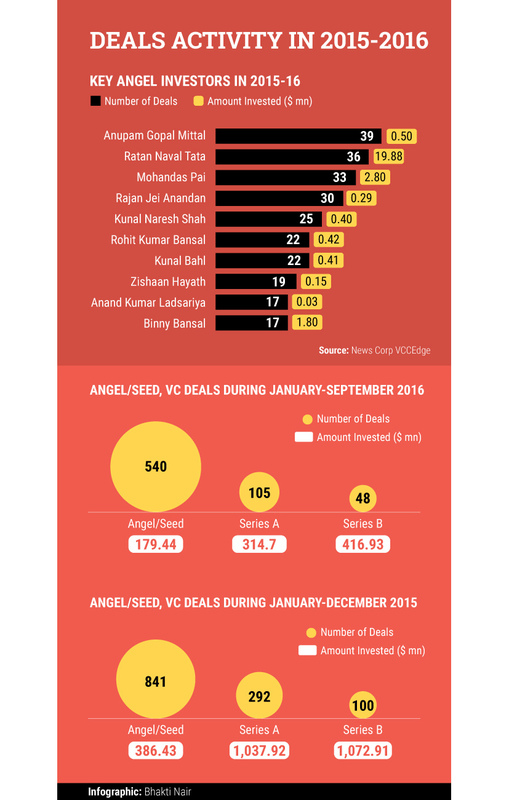 Angel and seed deals shrank by a mere 8% compared to an almost 38% drop in both VC and PE deals in the January-September period this year, according to the Quarterly Deal report by News Corp VCCEdge, the data and analytics division of The VCCircle Network. According to the report, there were 540 angel and seed investments compared with 153 Series A and B investments, contributing almost 78% to the venture fund flow. Last year, angels and seed investors contributed 68% to the venture deal funnel. Techcircle picks top 10 angel investors in the country in last 21 months. Currently, Internet software and services seems to be the favorite sector of the most active angel investors, followed by Internet retail, application software, healthcare technology and logistics. Key Investments - Raftaar Technologies Pvt. Ltd, About Number Pte. Ltd. and Anameha Infomedia Pvt. Ltd.
Sweet spot - His most preferred investment segment is Internet software and services. Besides Internet retail, he has been investing in sectors like application software, communication equipment, human resources and employment services, consumer electronics. Ratan Naval Tata - Chairman Emeritus of Tata Sons Ltd.
Key Investments â€“ ANI Technologies Pvt. Ltd. (runs Ola), Asian Teaxpress Pte. Ltd., Goqii Inc.
Sweet spot - His portfolio is spread across Internet retail, application software, and biotechnology but a majority of his investment has gone into startups operating in Internet software and services sector. Mohandas Pai - Chairman of Aarin Capital Partners and Manipal Global Education Services. Sweet Spot- Like his peers, Pai, too, has been investing aggressively in Internet software and services-based companies. Other sectors that he has routed his funds into include application software, Internet retail, asset management and custody banks, education services, and home furnishings. Rajan Jei Anandan - Vice President, South East Asia and India, Google. Key Investments - Applied Life Pvt. Ltd., Indifi Technologies Pvt Ltd, Innovaccer Inc., Mapmygenome India Ltd, Zipgo Technologies Pvt Ltd.
Sweet Spot- His investments also primarily include Internet software and services based companies, followed by IT consulting and other services, application software, Internet retail, air freight and logistics and biotechnology. Key Investments - About Number Pte. Ltd., Boatman Tech Pvt. Ltd., and Color String. Sweet Spot - Internet software and services-based startups dominate his portfolio. Rest of his investments have gone into companies operating in specialized consumer services, air freight and logistics and Internet retail sectors. Key Investments - Aisle Network Pvt Ltd, Alpinismo Online Ventures Pvt Ltd, Urbanclap Technologies Pvt Ltd, and Tinyowl Technology Pvt Ltd.
Sweet Spot â€“ In keeping with the trend, Internet software and service seems to be Bansal's most favorite sector. Other sectors comprising part of his portfolio are application software, Internet retail, brewers, leisure products, air freight and logistics. Key Investments â€“ Aisle Network Pvt Ltd, B9 Beverages Pvt Ltd, Betaout Inc., MadRat Games Pvt Ltd, Tinyowl Technology Pvt Ltd, Qustn Technologies Inc.
Sweet Spot â€“ Internet software and services again make for a major part of his portfolio. His other investments are in sectors such as application software, Internet retail, brewers, leisure products and air freight and logistics. Zishaan Hayath - Co-founder of Powai Lake Ventures and Haygot Education Pvt Ltd.
Key Investments â€“ A S Justride Tours and Travels Pvt Ltd, BeeWise Labs Pvt Ltd, BlackCotton Solutions Pvt Ltd, Urban Online Services Pvt Ltd.
Sweet Spot â€“ Major part of his portfolio is in Internet software and services companies and other investments are in sectors such as application software, other diversified financial services, air freight and logistics. Anand Kumar Ladsariya â€“ Founder, Everest Flavours Pvt Ltd.
Key Investments â€“ About Number Pte. Ltd, AdstringO Software Pvt Ltd, Anameha Infomedia Pvt Ltd, Color String. Sweet Spot â€“ Healthcare equipment, education, restaurants have been sectors he has been investing in along with application software and Internet software and services sectors. Binny Bansal - Co-founder and chief executive officer, Flipkart. Key Investments â€“ ADA News in Shorts Pvt Ltd, Applied Life Pvt Ltd, Tracxn Technologies, Qwikpik Technology, MadRat Games Pvt Ltd.
Sweet Spot â€“ Companies in aerospace & defence, healthcare technology and equipment, leisure products comprise his portfolio along with investments in Internet software and services that comprises almost 50% of his investments.